I don't think a rental from Apple will kill off Netflix. People with Netflix already have DVD players so they can rent without having to buy any new hardware, play it in the living room, bedroom, and in the car. It may kill off Netflix for those that can't wait a whole day for the movie to get there and $300 (+ tax) to spend for each TV in the house. Renting from itunes would be nice if I was stuck at an airport or somewhere away from home. Yeah, and I have a Macbook with 60GB of hard disk filling up fast. If I buy a movie from itunes, I would have to find a place to store it, like burn it on a DVD. Burn it on a DVD and not be able to watch it on my DVD player, hmm, I think I will just buy the DVD. I wish people would stop referring to the service that Napster and the like offer as "subscription". It is not. It is rental, and the two are very different. For a true subscription service, see eMusic. I still don't expect iTunes to offer rental on the music side, because there doesn't seem to be the demand. Movies and TV shows, on the other hand? I think there's definitely a possibility that Apple will offer a rental option in the future. I reallly don't see how you can have a subscription to digital online music and at the same time own it. If you subsribe to a magazine for 12 months, then end the subscription, do you have to give those magazines back? No - you just don't get any more. The eMusic service works like this: you pay eMusic a set amount each month, and this gives you the right to download a certain number of tracks in each month. Tracks that you download are yours to keep. So, the closer you get to your maximum allowance, the cheaper each track is. You do not get to roll over unused downloads from month to month. The media outlet cited Les Ottolenghi, chief executive of INTENT MediaWorks, a digital distribution system that works with peer-to-peer networks, as saying that he?s had meetings with people from Apple and believes the company will announce a subscription service for iTunes within the next six months. INTENT MediaWorks is now likely out of the picture. Somebody should have told ole Les that his Steveness is not a huge fan of loose lips, and he has shown himself more than happy to sink your ship. Sorry, I wasn't clear, I meant Netflix's download rental service. Their DVD mail service remains viable until bandwidth and economics tilt towards downloads, at which point if Apple is already doing download rentals, Netflix's growth path runs into a brick wall. Whatever, if you're seen to hit a dead end three, five years down the road, without the prospect of future earnings, your stock price will be as good as dead today. I agree. The primary reason for Apple to do subscription is to kick the last leg out from under the Zune/Zune Marketplace, and bury Microsoft's music efforts so deep that they won't be able to compete for many years. Basically, Apple has Microsoft backed into a corner, and MS knows it. Hard-drive based Zunes aren't doing that well, and will be blown out of the water by the 6G touchscreen iPod arriving later this year. Flash-based Zunes will show up, but will be 'Nano wannabees' at best. Wi-fi and 'the social' aren't differentiating the Zune the way MS had hoped. And since MS backstabbed its former PlaysForSure partners with the Zune and Zune Marketplace, while Apple meanwhile decided to open up the iTunes Store with DRM-free music, you may soon see the likes of Creative, SanDisk, Samsung, etc. advertising their next generation of players as being 'iTunes Compatible' as soon as they get AAC support. So what can MS do, now that it's all turning to sheeite for them? Basically give away Zunes, that's about it. How do you do that profitably? The same way cellphone makers do... make people contract for a term of service, and then use that to subsidize the hardware, making it cheap or free. 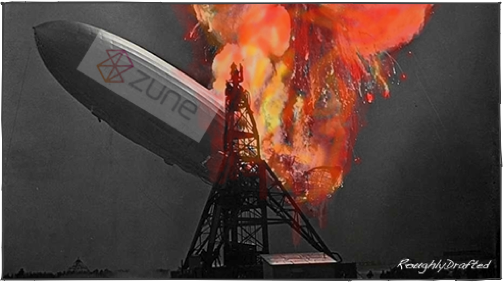 Something like a 'FREE (flash) Zune' with a 2-year subscription to the Zune Marketplace is probably Microsoft's last best hope in this space. Given that, what happens if Apple does the exact same thing too, and offers subscriptions & subsidized iPods in addition to its current offerings? Would there then be any remaining compelling reason to go with the Zune or Zune Marketplace? Uhh... no, not really, unless you're a member of the increasingly tiny 'Microsoft fanboi/anyone but Apple' clique, in which case you may be able to hold the Zune's marketshare steady at 'diddly squat'. I don't think Jobs likes subscriptions on general principle, but body-slamming what's left of Microsoft's music ambitions is something he can definitely get behind. We should know soon, because MS is running screaming towards the 'subscribe-and-subsidize' model as we speak. Well, actually, I think it's the perfect example to explain why people shouldn't use "subscription" to describe a rental service. Okay, do I use a "Well well, actually" or a "Well, actually actually" here? I don't think it's beyond the scope of the definition, nor do I think that it can't be both a subscription and rental service, such as Netflix. I agree with several of you, most people want to own music and want to rent movies. This would be good for movies. Strictly speaking, yes. But to refer to a rental service just as "subscription" with no other qualification causes problems. For example, when one refers to both Napster and eMusic as "subscription" and that's it, even though the two are very different. On the whole, people traditionally understand subscription to be a service along the lines of eMusic or a physical magazine subscription. And everyone understands what rental means. So, I just think it makes things much more obvious if you refer to a rental service as a rental service, not a subscription. I imagine Apple's music and video business model is under constant internal review. "The subscription services are not succeeding...People want to own their music, not rent it." I think music rental is contrary to the entire iTunes mantra and, while Apple does roll out new products and solutions, they seldom turn their backs on their fundamental philosophies. At the same conference, Mr. Jobs downplayed the importance of video, likely due to the lack of an effective distribution system. When the video iPod was released; however, the business model was patterned after the iPod; therefore, while the technology had been updated, the basic philosophy remained the same. In that vein, SJ also never said that people want to own their video. Temporary video downloads, therefore, make much, much more sense. Moreso, perhaps, than the current purchase/download/own model. To quote him further, "Purchasing music is an ingrained thing." Similary, renting movies is very much an "ingrained thing" and I think such a model could seriously help move units of the Apple TV. Without such a rental service, I think Apple will struggle to afford the Apple TV and iTunes Movie Store the same commanding market lead that their music-only siblings have enjoyed. Don't know how successful they've been, but I didn't find their selection to be all that great. Lots of independent labels; musicians, songs and albums I've never heard of. Did actually find some fairly cool stuff you may not find on iTunes. I've never really really looked for references. All I'm saying is that I've seen this happen with my sister's iPod a few times. It would be about thirty days after the last dock and the iPod would refuse to play a protected track. Dock it and then it will play a protected track. It's probably a very rare thing for people to run into. Her computer was so old, and she had internet connectivity problems that she never wanted to use it. I don't really get the point of the discussion about FairPlay. DRM suitable for rental is possible. If FairPlay as it is currently structured won't work, Apple can implement a version that will.